Driving a little further from the famous Chor-Minor to the north-east from the center of Bukhara, you can see the mosque-khanqah of Faizabad. It was built in 1598-1599, by famous Sufi Mavlono Poyanda-Mohamm Ahsi (Ahsiketi) Fayzobodi, who died 2 years later, in 1601. The building has two functions - the mosque, as evidenced by the mihrab for the prayer indicating the direction to Mecca, and the khanqah, as can be convinced, seeing three floors of hujras (cells) in which the dervishes lived. 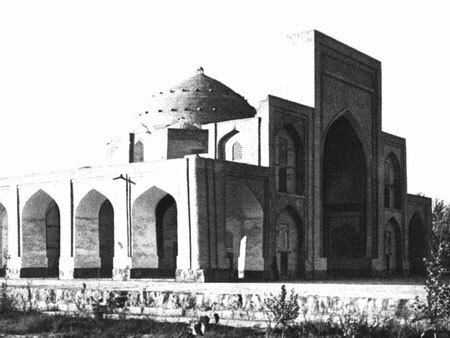 Previously, the building was called Shokhi Ahsi, but over time the name was transferred to the entire area surrounding the mosque and the mosque was renamed in honor of its builder. The architecture of the mosque is the model of architecture of the XVI century, in which the proportionality and symmetry is felt. The balanced facade is built on the stepped portal, and the building is flanked by majestic arch-domed galleries. The main dome, located in the center of the building, is unremarkable from the outside, but inside it is decorated with beautiful two-tone decoration of the ganch. Today, dervishes do not live here longer, and the Friday prayers are not held, but the religious atmosphere does not leave this place, and it seems that the mullah would call everyone to the evening prayer, and the mosque of Faizabad would fill with thousands of believers.